Ian Tapsall, girls field hockey coach at Staples High School, talks to the Board of Finance on Wednesday, April 3, 2019, in Westport, Conn.
WESTPORT — It was give and take at the Board of Finance meeting Wednesday night, with three key items — turf fields, transit district funding, and an $80,000 dip into the Board of Education’s carry-over account — respectively approved, denied, and deferred. In a unanimous, but somewhat begrudging approval, the BOF sanctioned a reduced figure of $4,785,269 to the Parks and Recreation Department for new turf fields. Work will now move forward this year in the replacement of fields and the track at Staples High School and Wakeman Park, with others to be completed next year. While several BOF members were put off by what they said was incomplete information and a shortened timeline for them to act, several comments about the safety of athletes help push the matter forward. “The bounce of the ball is becoming increasingly more dangerous,” Staples girls field hockey coach Ian Tapsall said in response to a suggestion that replacement of the Jenny Parker Field on the southeast side of the campus could be postponed for a few more years. “We probably have to patch at least five different areas on Jenny Parker,” he said, with pronounced damage especially noticeable in front of the goals. David Lyme, Staples rugby coach, said last year there were four concussions to team members, with three of them he said being the result of a player just hitting the old hardening turf. “We might as well be playing in the parking lot,” he said. Hoping to see some private individuals and groups raise funds, the BOF removed $200,000 from the original request for some extra items, including bleacher pads and sandpit covers. 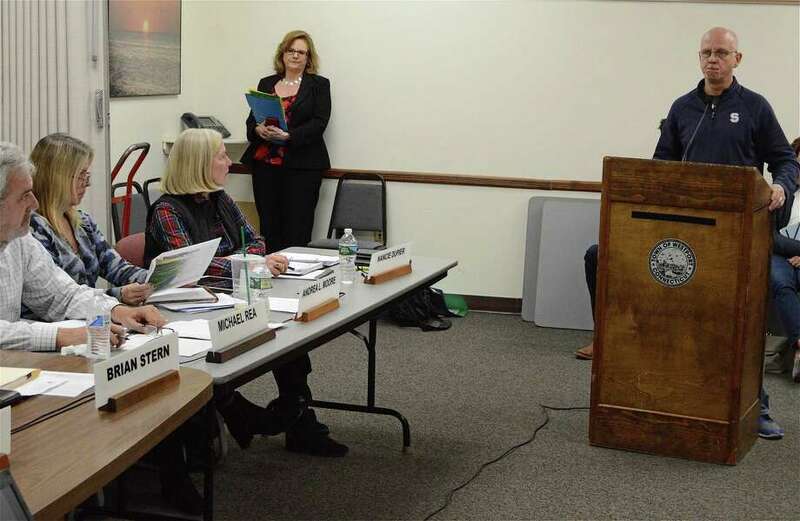 Meanwhile, Anthony Buono’s first official appearance before the BOF as Westport’s acting superintendent was met with a veritable “no” on a request to take an additional $79,500 from the school’s crry-over account to help fund a $279,000 facilities analysis. While BOF members said the concept behind the project was a good one, they questioned the timing of it, as well as the necessity of bringing in outside professionals before exhausting in-house resources in town. “We have about 13 people skilled in our buildings, very knowledgeable about them,” said Chairman Brian Stern, noting there had already been enough studies done of Coleytown Middle School at this time anyway. He and several other finance board members said the priority should be in deciding on educational plans, in particular the future of CMS and hiring a new superintendent of schools. Rather than withdrawing the request, Buono asked it be deferred until he could discuss the matter with the education board. Finally, despite a valiant presentation to restore $115,000 to the Westport Transit District’s budget, BOF members voted 6-1 against doing it. A few members indicated they thought it was really a decision for the Representative Town Meeting. Stern noted over the last five years the cost has been $32,000 per person for the shuttle buses to and from the train station. “I don’t know what the definition of waste is if that’s not a waste of town money,” he said. Noting that the buses probably cause more pollution than the cars that would be driven to replace them, he also cited the number of students driving or being driven as a much bigger cause of traffic. “If we are serious about traffic congestion in town, we should first go about getting those people on the school bus rather than driving,” he said. BOF member Michael Rea, who was the only dissenting vote, concurred.